Don't miss MCN Retro, a 32-page magazine free with next week's MCN, featuring retro metal like these three stunning bikes from Kent-based Spirit of the Seventies, a new custom house run by Tim Rogers and Kev Taggart. The bike-obsessed duo did the sportsbike/track days gig. But while getting a knee down on track is one thing, maximising the full potential of such clinically pure-bred machines on the road became so daunting it left them both looking for an alternative rush. 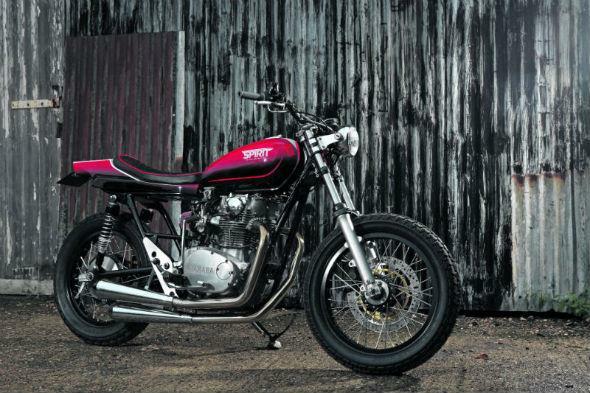 The 'alternative' came in the form of tarting up old Seventies iron - bikes no-one gave a second look to in the era, but thanks to inspired makeovers are becoming far more desirable than any current or classic mass-produced motorcycle that Japan Inc can deliver. 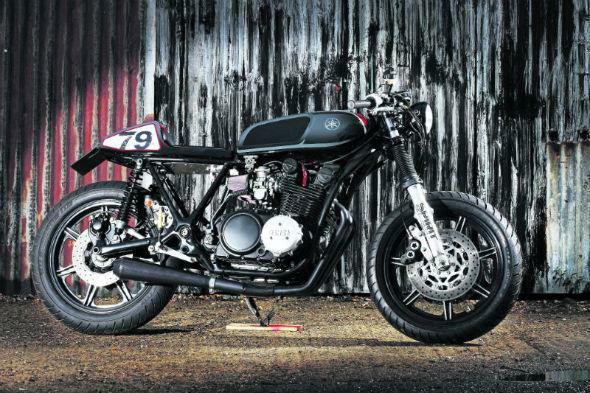 Rogers turned a staid XS750 shaft-drive triple into this minimalist cafe racer. Taggart created the really stunning streetracker from a stodgy Z750 Kawasaki twin. Both bikes use stock engines and frames - albeit the XS now has a later 850cc motor. But what has really transformed these bikes from very average production models into sparkling bespoke customs is simple, yet incredibly effective design and en acute attention to detail. Sharper handling, improved brakes and an extensive diet make both bikes a joy to ride. 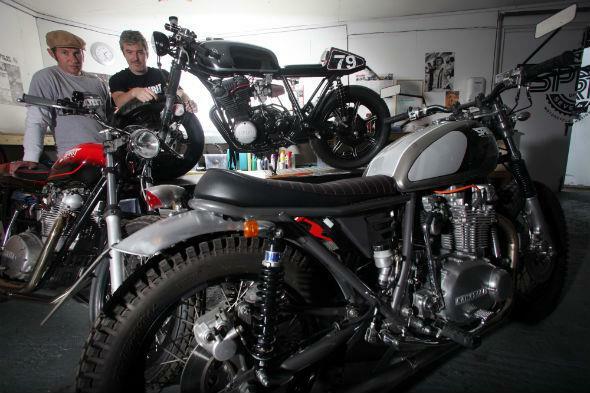 Their bikes achieved instant acclaim, and both Taggart and Rogers enjoyed the creative process as much as the speed thrills of riding them, so just one year ago Spirit of the Seventies was born and the workshop/biker retreat was established in a former pig shed in Kent just a five minute ride from Brands Hatch! Rogers is a photographer by trade, Taggart a graphic designer. Which explains why the lines of their bikes are so pleasing. While they do a huge amount of work themselves, they also draft in specialists to complete the builds. You only have to check out the bikes - and their spec sheets - to appreciate the top-class companies that Spirit have formed partnerships with. There's real quality workmanship here. But Spirit of the Seventies isn't just about old bikes. Their latest creation is based on a modern Hinckley-built Triumph Scrambler. So it's not the age of the machine that matters. It's an appreciation of aesthetics and a desire to create a bespoke motorcycle that's guaranteed to turn heads - as well as being a blast to ride. 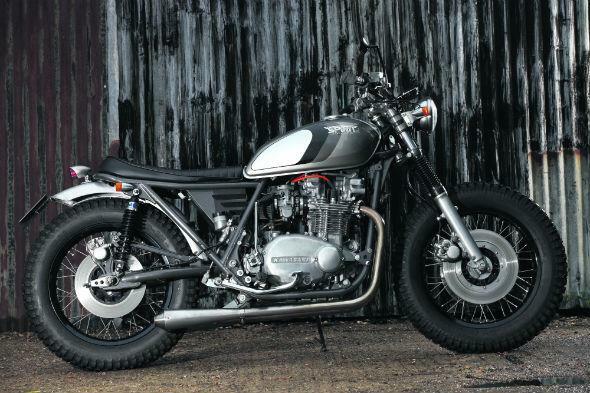 This street scrambler Kawasaki started life as a 1976 Z750 B1 and was the genesis of Spirit of the Seventies. Taggart had a KTM SuperDuke R at the time for trackdays and a more 'sensible' Ducati ST4 for the road and wanted a classic to add to his stable. He said: "The original bike came out at the wrong time when everyone else was buying Z1s and then Z1000s. Kawasaki only sold a few twins in the UK but it's a solid bike and doesn't leak oil. The hardest thing with any project like this is getting the proportions right. There is an equation. I don't profess to know it but I know when something looks right." Tim bought this 1979 Yamaha XS750 shaft-drive triple as an antidote to his Honda FireBlade and ended up going for a total revamp, drawn up by Kev. The motor was replaced with a later, more torquey XS850 lump which slots straight in to the stock frame. The suspension has been jacked at the rear, dropped at the front to make it a real sharp-steering racer. Gibson exhaust is bespoke and given a black ceramic coating. Tank is again stock but the seat carries all the electrical gear and is especially made in carbon to Kev's sketches and the CAD drawings by Lee at King Carbon in Essex then covered by Trimmania, Oxford. This 1978 XS650 Yamaha is given a Streetracker makeover by Spirit - the twin-cylinder being a cornerstone of similar customs given the historic significance of the machine and Kenny Roberts' early career of dirt track racing on one. Spirit have stripped and lightened this bike. The motor is stock but it's got Keihin flatside carbs wth K&N air filters. Front brake is an R6 front caliper with a floating FZR1000 rotor. Forks are stock with an added Tarozzi forkbrace. There's new shocks, a bespoke exhaust system and dirt track XR750-style seat to create a classic streetracker with Spirit's own slant on the project. 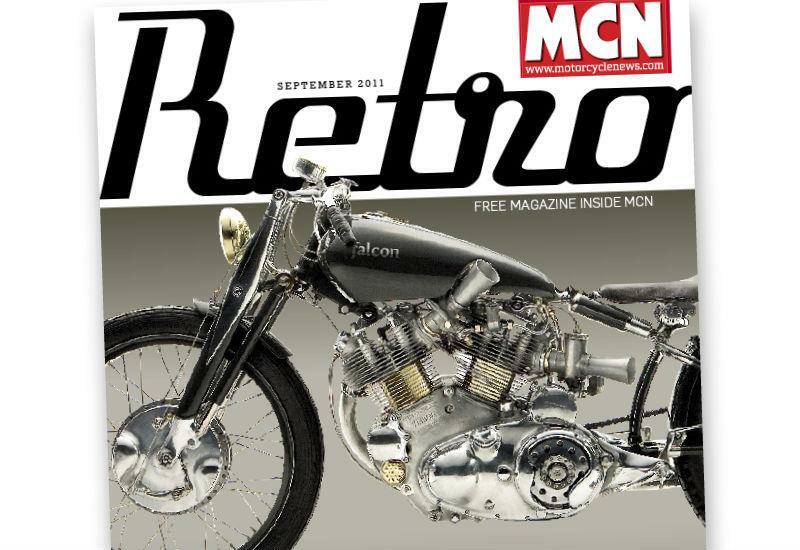 Don't miss next week's MCN for the free 32-page MCN Retro magazine featuring bikes like the Spirit of the Seventies machines.